Striving to become the National Hockey League’s first female general manager, Kelsey Bigham knows she has her work cut out for her. 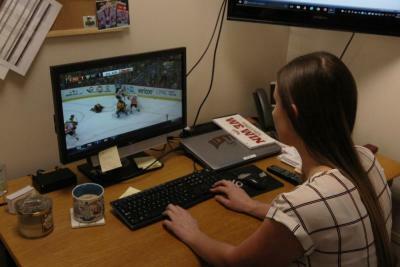 So when I glide into her office, nestled in Magness Arena, the newly appointed University of Denver men’s ice hockey director of hockey operations is unsurprisingly hard at work, tagging faceoffs on video. Practice for the Pioneers just ended, but the work has only begun for Bigham. To understand how Bigham got to this point, only the third active female director of hockey operations for a Division I college hockey program, and the youngest, is a story that kicks off 23 years ago and has been building traction ever since. “I’m a 1995 birth year, so I was born the same year the Avs won the Stanley Cup,” Bigham said. My earliest hockey memory was watching the 2001 Stanley Cup, which ironically our volunteer coach Steve Reinprecht played in. “I fell in love with it. It was fast, hard-hitting, definitely a grittier time in hockey for sure. A different era. Watching it, I fell in love with the game,” Bigham said. 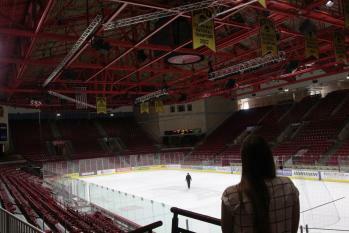 Growing up in Colorado Springs, an hour south of the University of Denver’s campus, Bigham got her hockey fix at Colorado College games, frequenting them whenever her parents would let her. One player on the Tigers, goaltender Joe Howe stood out to her. She would later meet Howe at DU’s employee orientation, with Howe transitioning to the director of hockey operations role after a stint as volunteer coach. Bigham was entering the program as a sports program assistant, overseeing finances for men’s hockey and five other sports. “I was like no way…this guy was my idol growing up,” Bigham exclaimed. Unable to contain her devotion to the sport, Bigham asked to shadow Howe in the position that she would surge into a year later. When Howe left to become an assistant coach at the University of Alaska-Fairbanks, Carle thought it was obvious who should capture the role next. Bigham now holds a role that she loves. Before Denver, Bigham held the Chief Operations Officer position for Colorado State University’s men’s hockey team, where she oversaw statistics, game day operations and team travel. Working for a club program has its challenges, but it also provides a heap of experience in all aspects as its all hands-on deck. Originally wanting to be a lawyer, Bigham eventually changed her mind. While her political science degree isn’t directly related to what she’s doing now it's given her a valued, different perspective. 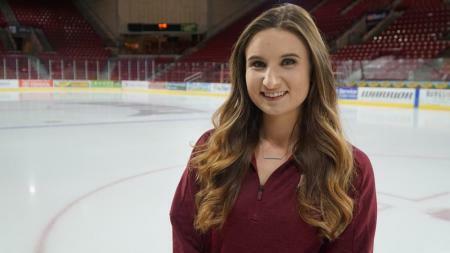 Earning her degree, along with her time at Colorado State ansd last season with the Pioneers played a role in Bigham getting the opportunity to handle the behind the scenes work of one of college hockey’s premier programs. However, most important was the influence of her parents. While walking around campus into the arena to meet Kelsey, it was hard not to notice the vast number of tents that littered the greens outside the rink. The students were camping out on Friday night, in a quest to be first in line once season tickets become available. The college hockey season is about to get underway. Denver fell in the NCAA Regional last year as they looked to repeat their 2017 National Championship. They have a good squad this season, and they’re going to need it to compete in the National Collegiate Hockey Conference, which boasts the past three National Champions. The USA Today/USA Hockey Magazine Preseason poll has the Pioneers in the 11th spot. One matchup to highlight is when they welcome the No. 5 Providence Friars on Nov. 23-24. Not only does it serve as a matchup between two programs with championship aspirations, but because the magicians behind the scenes of putting together the weekend series are Bigham and another female director of hockey operations counterpart, Providence’s Theresa Feaster. With the end goal of becoming an NHL general manager in her mind, it helps motivate Bigham to work hard and go the extra mile. With her dedication to the sport of hockey, you can’t count her out. She’s all in.